Sugar Swings! Serve Some: rainbow madeleines for a virtual baby shower...! so a bunch of us decided on a "rainbow" themed shower, well because meaghan and her daughter love rainbows (they did this cool rainbow birthday party)...and well, who doesn't like rainbows, they just make you smile, right??! snip one end of the zip lock bag (a small snip) and pipe lines of color - horizontal or vertical, whatever you prefer! 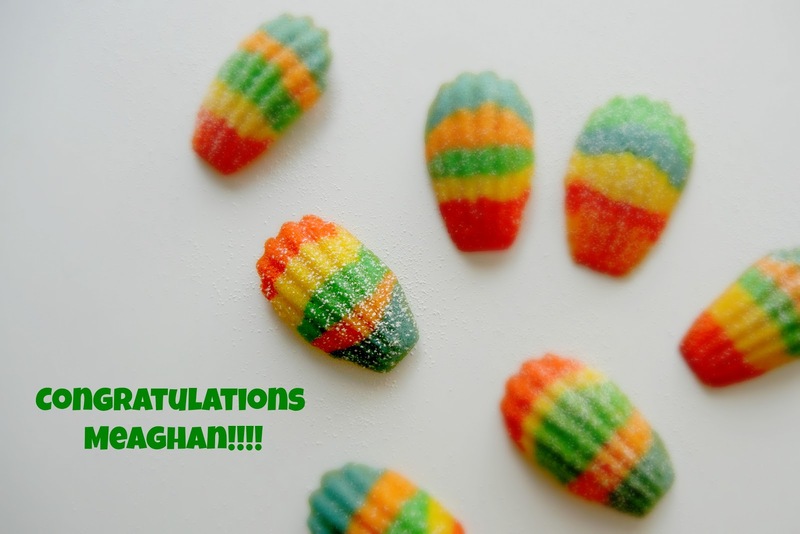 and you get some really fun rainbow madeleines to celebrate a brand new baby as well as a great person and friend! Super Congrats MEAGHAN!!!!! i am so very excited for you and hope you and baby Violet are doing great! 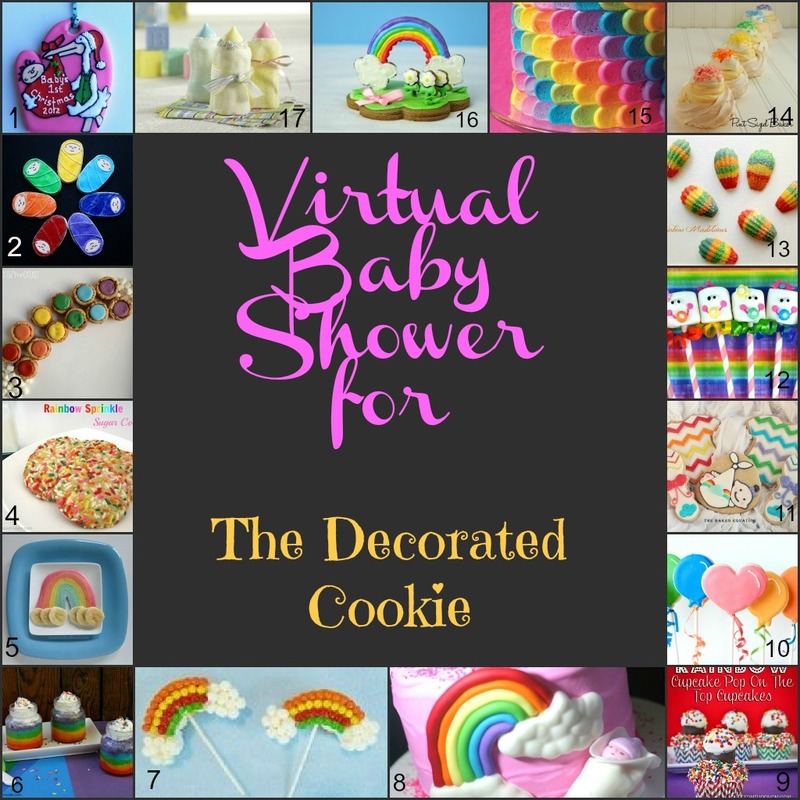 All of these other creative bloggers are also participating in the rainbow shower too! Please take a look at all of the fun stuff they have come up with to celebrate this special occasion! Thank you ladies, it's been a blast!!!! THANK YOU Kathia for putting together this sweet collage! Sharing at these fun blog hops! 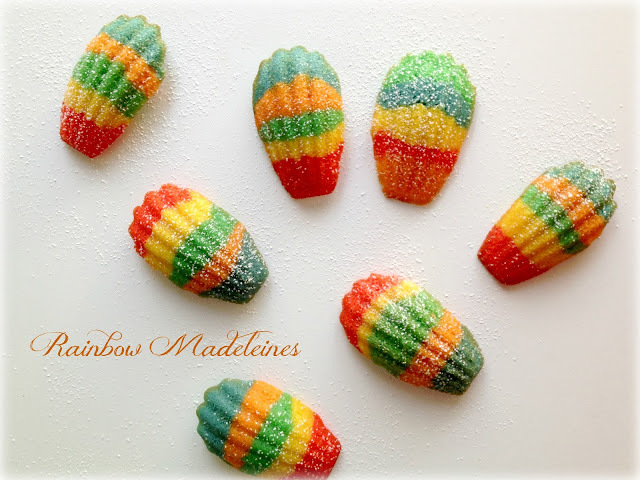 This rainbow madeleines are fantastic, I love how it makes such a great presentation, but is still pretty doable for the average baker (like me!). thank you! the recipe is simple and even making the rainbows are relatively simple too! What madeleine recipe did you use to get the batter so stiff? The link is broken. Also, what kind of food colorings did you use to dye the madeleines? Thanks in advance! Hi Clarissa, you can use this recipe. https://www.kingarthurflour.com/recipes/vanilla-scented-madeleines-recipe Bake them at 350 for only 7-8 mins or until just done. I usually use Wilton brand food colorings. Hope that helps! I was really looking forward to this post, I've made these cookies few times, and maybe it is just the pan I'm using or something else, but they never come out so pretty like yours. I love how you did the rainbow ones, they are really one of a kind! Michelle, thank so much for organizing this beautiful collaboration and for inviting me to come along. These are so pretty...love them! Beautiful! These may have convinced me that I NEED a madeleine pan. Oh, these are beautiful, Michelle! I'm so happy that you picked the rainbow theme...everything is so pretty and happy! Thanks for organizing this shower and inviting me to participate; it's been so much fun! 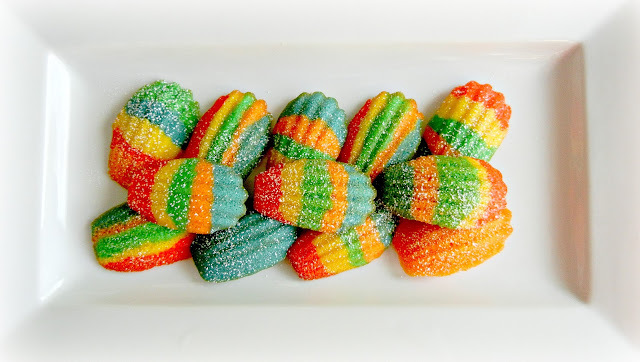 it HAD to be rainbow madeleines. It just HAD to be. The hugest THANK YOU I can muster for this wonderful, colorful surprise, especially for organizing!! It just made my and Violet's day. You have no idea!! I really want to drive around the country and hug each and every one of you. THis has been the most amazing surprise I could imagine!!! These are beyond gorgeous! I need to make madeleines myself. Thanks for including me in this Michelle! I've never had a madeleine and I've never seen such wonderful ones before! You are a madeleine master! Such a wonderful treat to bring to Meaghan's shower. P.S. Thanks so much again for asking me to be a part of it. Such fun! What a fun shower theme - I'm sure Meaghan is over the rainbow excited! 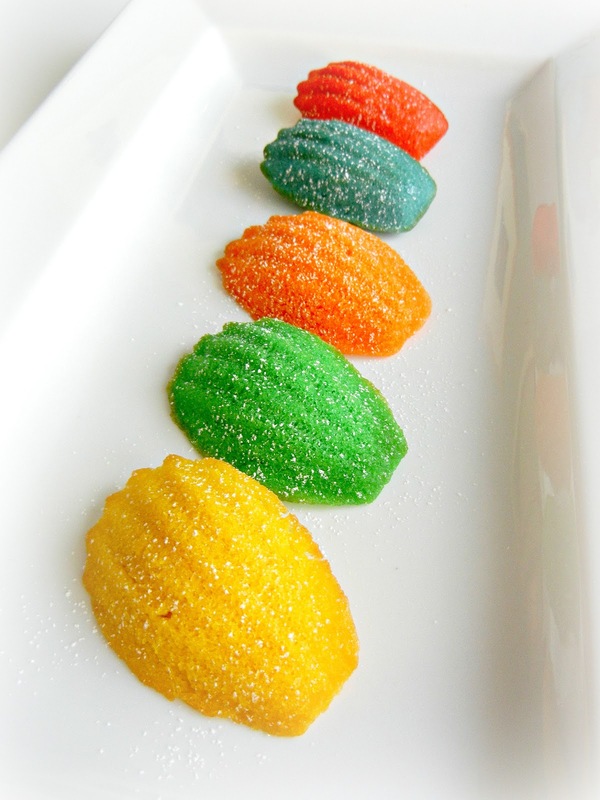 I love the madeleines in those bright colors! ooh - yum!! These look so pretty with all the colors! These are so stinkin' cute! They look like hot air balloons =o) I love madeleines! And these are awesome. Thanks so much for putting the party together and including me. You are awesome! And these Madeleine are awesome! I've never made nor have tried these, but I've got to now!